Peanuts bring thoughts of cocktail snacks, baseball games and, of course, peanut butter and jelly sandwiches. Peanuts are very popular whether roasted, raw, shelled or unshelled, peanuts are available throughout the year. Contrary to what their name implies, peanuts are not true nuts but a member of a family of legumes related to peas, lentils, chickpeas and other beans. 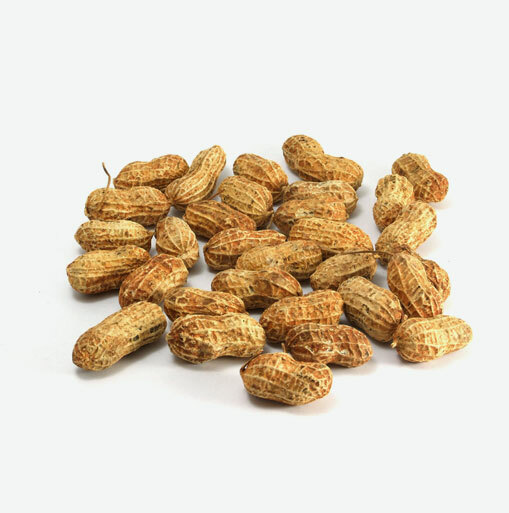 Peanuts start growing as a ground flower but because of its heavy weight, the plant bends towards the ground and eventually burrows underground where the peanut actually matures. The veined brown shell or pod of the peanut contains two or three peanut kernels. Each oval-shaped kernel or seed is comprised of two off-white lobes that are covered by a brownish-red skin. Peanuts have a hardy, buttery and “nutty” taste. While there are many varieties of peanuts, the ones most commonly found in the marketplace are the Virginia, Spanish and Valencia. Peanuts originated in South America where they have existed for thousands of years. They played an important role in the diet of the Aztecs and other Native Indians in South America and Mexico. Peanuts oleic acid, the healthful fat found in olive oil, but new research shows these tasty legumes are also as rich in antioxidants as many fruits. Studies show that women who eat just one ounce of nuts, peanuts or peanut butter each week have a 25% lower risk of developing gallstones. Preventing gallbladder disease may be as easy as packing one peanut butter and jelly sandwich (be sure to use whole wheat bread for its fiber, vitamins and minerals) for lunch each week, having a handful of peanuts as an afternoon pick me up, or tossing some peanuts on your oatmeal or salad. When choosing peanuts, make sure that the bulk bins containing the nuts are covered and that there is a good turnover of peanuts as this will ensure maximum freshness. Whether purchasing peanuts in bulk or in a packaged container, make sure that there is no evidence of moisture or insect damage. If it is possible to smell the peanuts, do so in order to ensure that they do not smell rancid or musty. Whole peanuts still in their shell are usually available in bags or in the bulk bins. If possible, pick up a peanut and shake it, looking for two signs of quality. First, it should feel heavy for its size. Secondly, it should not rattle since a rattling sound suggests that the peanut kernels have dried out. Additionally, the shells should be free from cracks, dark spots and insect damage. Shelled peanuts should be stored in a tightly sealed container in the refrigerator or freezer since excess exposure to heat; humidity or light will cause them to become rancid. Shelled peanuts will keep in the refrigerator for about one month and in the freezer for up to three months. They should not be chopped prior to storage, only right before eating or using in a recipe. Peanuts can be chopped by hand using a chef’s knife and a cutting board or in a wooden bowl with a curved knife that has a handle sitting on top of the blade which is known as a “mezzaluna”. They may also be chopped in a food processor, yet care needs to be taken to not grind them too much since the result may be more like chunky peanut butter than chopped peanuts. The best way to chop peanuts in a food processor is to place a small amount in at a time and carefully use the pulse button until you have achieved the desired consistency. To make your own peanut butter, place the peanuts in the food processor and grind until you have achieved the desired consistency. Sprinkle peanuts onto tossed salads. Instead of a peanut butter and jelly sandwich, try peanut butter and banana, peanut butter and honey, or peanut butter and chopped apple, pear and/or raisins.